Peerless Pterosaur Could Fly Long-Distance For Days The massive prehistoric creature, with its 35-foot wingspan, may have been the largest flying animal that ever lived. New research suggests the "reptile, bird, giraffe and bat all squeezed into one" could fly 80 mph for up to 12,000 miles. The natural world's long-distance flight champions are seagoing birds that fly up to 6,000 miles nonstop. But now, two scientists are proposing to give the honor to the pterosaur, a massive creature from the distant past. Above the dinosaur exhibit at Pittsburgh's Carnegie Museum of Natural History, a giant pterosaur skeleton hangs from the ceiling. This is a Quetzalcoatlus, thought to be the largest flying animal that ever lived. It has a massive skull with a beak-like mouth, and its wingspan takes up almost the entire ceiling. "It would have been a very bizarre animal to see fly above you or walk around on the ground," says Mike Habib, a specialist in biomechanics from Chatham University. "It would look like a strange amalgamation of a classic modern reptile, bird, giraffe and bat all squeezed into one." 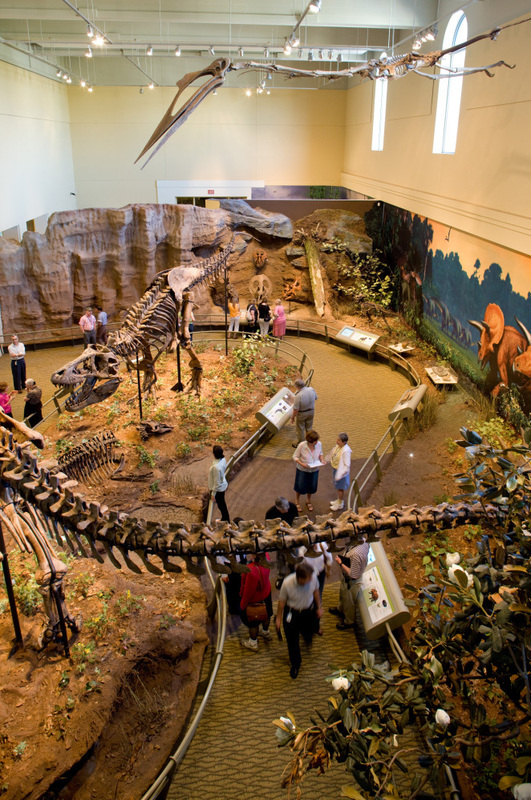 A pterosaur skeleton looms over two T. Rex skeletons at the Carnegie Museum of Natural History in Pittsburgh. The pterosaur is thought to be the largest flying animal that ever lived. The pterosaur's wingspan and size have spawned comparisons to dragons. But recently some scientists wondered whether the creature was too big to fly. A pair of papers recently asserted that the biggest pterosaurs may have been too heavy to get off the ground. That seemed implausible to Habib. After all, the biggest birds often have the longest flight range. 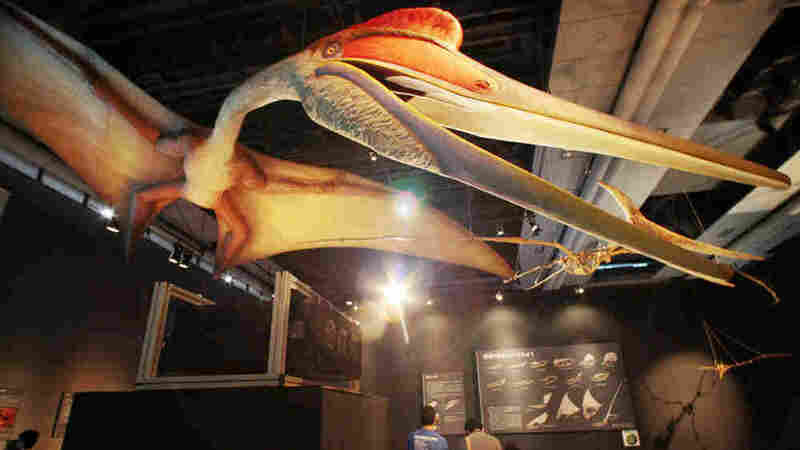 And Quetzalcoatlus, with its 35-foot wingspan, certainly fits the bill for gigantic. So Habib teamed up with Mark Witton, a British paleontologist, to plug in factors like wingspan, weight and aerodynamics into a computer model. The results, which they presented at a conference last month, were staggering: They revealed an animal that could fly up to 80 miles an hour for 7 to 10 days at altitudes of 15,000 feet. The maximum range, Habib says, was probably between 8,000 and 12,000 miles. "That doesn't mean necessarily they did, doesn't mean necessarily a specific number, just that it would be long enough to say, cross an ocean," Habib says. Habib and Witton further spelled out the lizard's flight mechanics in a paper published this month in the journal PLoS ONE. Their hollow bones, strong wing muscles and a powerful launch mechanism all point to an animal literally built to fly, they argue. David Unwin, a paleobiologist at the University of Leicester in England, agrees with Habib that Quetzalcoatlus could fly, but he's not convinced about the distance. Pterosaurs, with their 35-foot wingspans, may have launched themselves airborne by using all four limbs -- their wings and legs. "Where we get into more difficulty is in some of the claims about flight performance," he says. Unwin says these types of projections are premature for a fossil as mysterious as this one. Only one adult skeleton of Quetzalcoatlus has ever been discovered. And that consists of fragments of just one wing. That makes estimating a basic feature like body mass a near crapshoot. Without a deeper fossil record, Unwin says, there are only a few conclusions one can make about these animals. "Yes, we had giant pterosaurs, and yes they could fly, and yes they lived at end of Cretaceous, and we can't say a whole lot more," he says. Unwin and Habib say there may be more to say in the years to come. That's because dig sites in Germany, Brazil and China have turned out to be hotbeds for pterosaur fossils. Habib is hoping that in one of these beds lie clues to how fast and how far these ancient animals could fly.